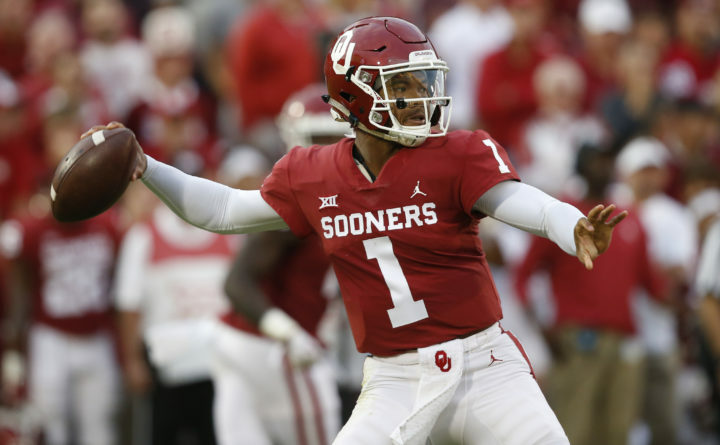 FILE - In this Sept. 22, 2018, file photo, Oklahoma quarterback Kyler Murray (1) throws in the first half of an NCAA college football game against Army, in Norman, Okla. Kyler Murray, the first-round Major League Baseball draft pick and Heisman Trophy-winning Oklahoma quarterback, says he is declaring himself eligible for the NFL draft. Murigible for the NFL draft. Murray announced his decision Monday, Jan. 14, 2019, in a tweet. Murray was the ninth overall pick in last June’s baseball amateur draft, and the outfielder agreed to a minor league contract with Oakland for a $4.66 million signing bonus. He is a football quarterback and is eligible for this year’s NFL draft, which starts April 25. Murray’s baseball deal called for him to receive $1.5 million within 30 days of the deal’s approval last summer by Major League Baseball and $3.16 million on March 1. While there is a provision for a team to get an extra draft pick in the following draft if it fails to sign a player selected prior to the fourth round, there is no such provision for a player who signed and then decided not to play.